Specialization, research and quality control form the basis of success for Gates. 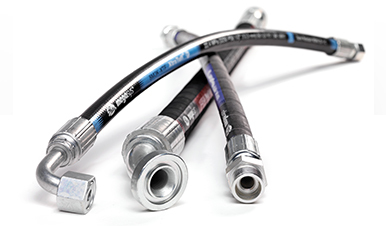 The hydraulic hoses from this leading American brand are compact, flexible and designed to withstand the toughest environments. It is extremely easy to identify and attach the corresponding couplings, with the clear coding applied on the hoses. In the field of transmission and hydraulic connection technology, the American company Gates has been a leading manufacturer since 1911. Basically, there are 3 areas in which Gates is particularly active: the production of rubber and polyurethane belts, the production of hydraulic, industrial and engine hoses and, finally, the manufacture of metal pipes. Gates places quality, reliability and safety at the heart of its strategy and is well known on the market for its knowledge and innovation. Thanks to a very strong Research and Development department, Gates is constantly focusing on discovering new technologies and possibilities in order to meet the needs of the customer.